Reefer Madness Lies Must Go! (http://www.druglibrary.org/schaffer/index.HTM ). I have posted thousands of pages of newspaper items, magazine articles and books relating to marijuana prohibition without encountering a single word of truthful support for the policy. Never in any of the propaganda offered by the ban marijuana crowd have I found a shred of valid evidence. Anslinger lied and so has every other opponent of cannabis. A few scientists like Gabriel Nahas have created fraudulent studies, but none have found an honest reason to punish marijuana use. 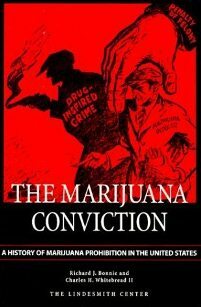 The lying began with Harry Anslinger who claimed that "[Smoking] one [marihuana] cigarette might develop a homicidal mania, probably to kill his brother." and continues with absurd claims about brain damage and moral decay. Anyone who believes that marijuana should be illegal should never hold public office because they are either brain dead stupid or badly corrupted. The drug crusaders lie all the livelong day, but hopefully, the public is ready to deep six their nonsense once and for all time. It is a national disgrace that many politicians endorse marijuana prohibition which destroys hundreds of thousands of people without cause every year. Marijuana prohibition is a sham from A to Z and must be ended. The list of anti MJ proponents grows exponentially with the Financial concerns from stocks, bonds real estate that depend on these anti industries,Washed drug money flows into Wallstreet to be washed. Like when Mrs Clinton responded to being questioned about whether MJ would ever be legalized..."No, there's too much money in it." Too much money depends on it not becoming legal, quite literally.